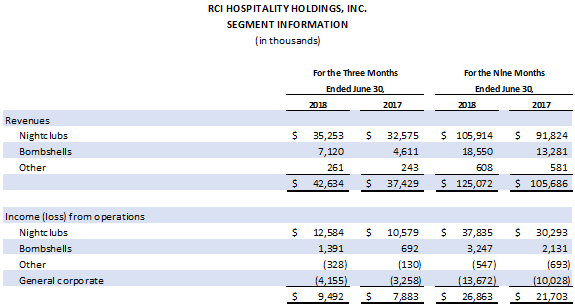 HOUSTON - August 9, 2018 - RCI Hospitality Holdings, Inc. (Nasdaq: RICK) today announced strong results for the Fiscal 2018 third quarter ended June 30, 2018. Eric Langan, President & CEO, invites investors to meet management at one of RCI's top revenue generating clubs. "Fiscal 2018 continues to perform well with an impressive third quarter, which often begins our seasonally softer second half," Mr. Langan said. "Instead, 3Q18 total revenues hit a quarterly record of $42.6 million, up 13.9% year over year with same-store sales growth of 5.0%. "Nightclubs and Bombshells revenues and margins benefited from our improved portfolio of locations, increased customer counts, and a strong sports viewing line up. Nightclubs also benefited from a good economy, including revitalization of the Texas oil patch, while Bombshells operating leverage benefited from significantly higher sales volume. "Corporate overhead increased as anticipated due to expenses necessary to develop controls and automated reports for our new financial IT system. Occupancy costs fell as a percentage of revenues, and the effective tax rate declined due to the Tax Cuts and Jobs Act. 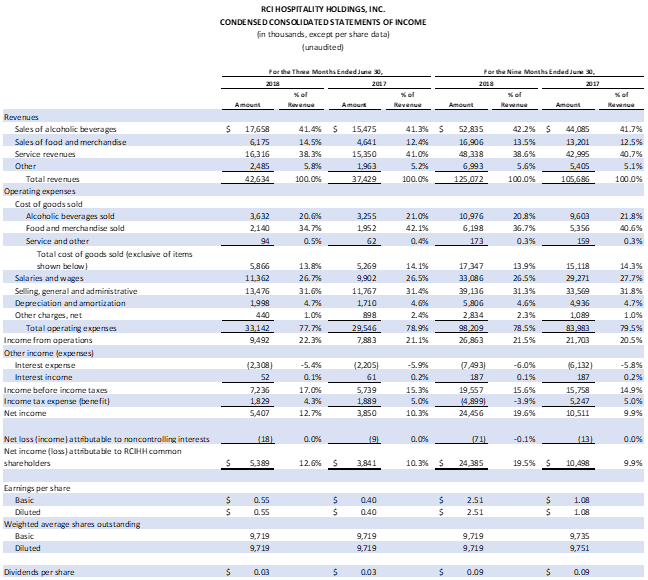 "The result is that non-GAAP EPS increased 23.9% to $0.58, and free cash flow grew 17.2% to $7.7 million for the quarter and 23.9% to $20.6 million year-to-date. As a result, we expect to exceed our $23 million FY18 FCF target. "We have four new Bombshells locations in development in Greater Houston, scheduled to open in late September 2018, December 2018, March 2019, and June 2019. That will bring our total number of Bombshells to 10—eight in the Houston area and one each in Dallas and Austin. As of June 30, 2018, their average annual unit volume totaled more than $4.5 million. At this rate, 10 units would create a $40 million to $50 million annualized business. "With our Bombshells plan in place, our business development focus shifted in 3Q18 to acquiring more great gentlemen's clubs at the right prices in the right markets. We are in active negotiations that look highly promising with club owners in several top metro markets. We calculate there are about 500 clubs with licenses, locations and management likely to meet our parameters for quality and profitability. Those are the type of clubs we want to acquire. "And, as always, we will continue to adhere to our capital allocation strategy." Total revenues increased $5.2 million as all core revenue lines continued to grow. Beverage rose $2.2 million (up 14.1%), food $1.5 million (33.1%), and service $1.0 million (6.3%). New units added $2.7 million. This reflected a full quarter of a Bombshells Restaurant & Bar on Highway 290 in Houston (opened in 4Q17), nearly a full quarter of a new Bombshells in the Houston suburb of Pearland (opened in early April), and the renamed Kappa Men's Club, a well-known gentlemen's club in Central Illinois (acquired late May). Last year's two major acquisitions, Scarlett's Cabarets in St. Louis and Miami, which occurred during 3Q17, transitioned into same-store sales over the course of 3Q18. Many locations, in particular, the six Bombshells sports bars in Texas, benefited from increased traffic created by the Houston Rockets playing in the NBA Western Conference Finals, and the champion Houston Astros' start of the professional baseball season. Operating income increased 20.4% to $9.5 million (22.3% of revenues) from $7.9 million (21.1% of revenues). Other charges, net of $0.4 million consisted of a $0.5 million lawsuit settlement partially offset by a small gain on sale of a property. On a non-GAAP basis, operating income increased 13.0% to $10.0 million (23.4% of revenues) from $8.8 million (23.6% of revenues). As a percentage of revenues, gross profit margin increased 32 basis points to 86.2%. Sales increased 8.2% to $35.3 million from $32.6 million, with 38 units compared to 40. Operating income increased 19.0% to $12.6 million (35.7% of segment revenues) from $10.6 million (32.5% of segment revenues). On a non-GAAP basis, operating income increased 12.9% to $13.0 million (36.8% of segment revenues) from $11.5 million (35.3% of segment revenues). Sales increased 54.4% to $7.1 million from $4.6 million, with 6 units compared to 4, reflecting a full quarter of Bombshells on busy Highway 290 in Houston and nearly a full quarter of our largest Bombshells location to date in the fast-growing Houston suburb of Pearland. Same-store sales increased 4.1% as customers continue to be attracted to our military themed social dining concept with our Bombshells Girls, where you can have a great time and great food, watch the game, listen to music and hang out with friends or family. Operating income increased 101.0% to $1.4 million (19.5% of segment revenues) compared to $0.7 million (15.0% of segment revenues). Cash and cash equivalents increased 5.4% to $13.2 million at June 30, 2018 from $12.5 million at March 31, 2018. Occupancy costs (rent and interest expense as a percentage of total revenues) fell to 7.6% from 8.2%. Adjusted EBITDA increased 13.6% to $11.9 million from $10.5 million. Effective tax rate was 25.3% compared to 32.9%. For the nine months ended June 30, 2018, based on net cash provided by operating activities of $22.4 million, less maintenance capital expenditures of $1.8 million, free cash flow (FCF) totaled $20.6 million compared to $16.6 million for the comparable FY18 period. RCI's FY18 FCF target of $23 million is based on estimated net cash provided by operating activities of approximately $25.5 million, less projected maintenance capex of approximately $2.5 million. 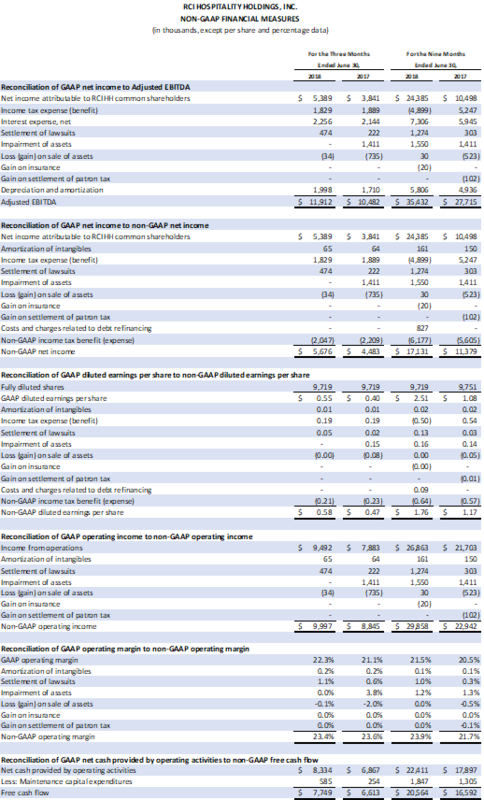 Non-GAAP Operating Income and Non-GAAP Operating Margin. We exclude from non-GAAP operating income and non-GAAP operating margin amortization of intangibles, gains or losses on sale of assets, gain on insurance, and settlement of lawsuits. We believe that excluding these items assists investors in evaluating period-over-period changes in our operating income and operating margin without the impact of items that are not a result of our day-to-day business and operations. Non-GAAP Net Income and Non-GAAP Net Income per Diluted Share. We exclude from non-GAAP net income and non-GAAP net income per diluted share amortization of intangibles, costs and charges related to debt refinancing, income tax expense (benefit), gains or losses on sale of assets, gain on insurance, and settlement of lawsuits, and include the non-GAAP provision for current and deferred income taxes, calculated at 26.5% and 33% effective tax rate of the pre-tax non-GAAP income before taxes for the quarter ended December 31, 2017 and 2016, respectively, because we believe that excluding and including such items help management and investors better understand our operating activities. Adjusted EBITDA. We exclude from adjusted EBITDA depreciation expense, amortization of intangibles, income tax expense (benefit), net interest expense, gains or losses on sale of assets, gain on insurance, and settlement of lawsuits because we believe that adjusting for such items helps management and investors better understand operating activities. Adjusted EBITDA provides a core operational performance measurement that compares results without the need to adjust for federal, state and local taxes which have considerable variation between domestic jurisdictions. The results are, therefore, without consideration of financing alternatives of capital employed. We use adjusted EBITDA as one guideline to assess our unleveraged performance return on our investments. Adjusted EBITDA is also the target benchmark for our acquisitions of nightclubs. Management also uses non-GAAP cash flow measures such as free cash flow. Free cash flow is derived from net cash provided by operating activities less maintenance capital expenditures. We use free cash flow as the baseline for the implementation of our capital allocation strategy. Unit counts above are at period end. Planned opening dates are subject to change due to weather, which could affect construction schedules, and scheduling of final municipal inspections. With more than 40 units, RCI Hospitality Holdings, Inc., through its subsidiaries, is the country's leading company in gentlemen's clubs and sports bars/restaurants. Clubs in New York City, Miami, Charlotte, Dallas/Ft. Worth, Houston, Minneapolis, St. Louis and other markets operate under brand names, such as Rick's Cabaret, XTC, Club Onyx, Vivid Cabaret, Jaguars, Tootsie's Cabaret, and Scarlett's Cabaret. Sports bars/restaurants operate under the brand name Bombshells Restaurant & Bar. Please visit http://www.rcihospitality.com.